WorldMate has partnered with American Express Business Travel to power the new AmEx BlackBerry app. 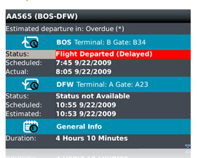 WorldMate’s mobile apps is similar in theory to TripIt, and is catered specifically for business travelers. The app sends push alerts to your phone about flight cancellations, sudden meeting changes, and last second booking requirements. Services including in the American Express Business Travel app includes automatic itinerary synchronization, pop-up flight alerts accompanied by suggested alternative flights when necessary, calendar synchronization to add business meetings into the itinerary, and the ability to share itineraries with colleagues and business contacts. And you can search for and connect with LinkedIn contacts in the app. The app also features itinerary integration with third party mapping and navigation applications and direct access to American Express Business travel counselors. While there are a number of mobile travel organizers in the space, the branded app has the virtue of being the branded app for American Express, a credit card and service which is widely used by business travelers. And WorldMate says it already has 5 million users of its mobile apps.